The project was originally due to be carried out in the 2011/12 school calendar. Due to the project’s complexities and the disruption it would cause to the school it had been delayed. The school wanted the works undertaken during the school holidays, but had been advised that it was impossible to do in 6 weeks. Robert Woodhead was able to offer a solution to the School which would enable the works to be completed to their programme. The EMPA process was critical in delivering this project to the required timescales. Appointing Robert Woodhead at an early stage in the process enabled pre-start meetings, mechanical and electrical, asbestos and ceiling co-ordination meetings before starting on site. The collaborative nature of the EMPA Minor Works Framework built a spirit of trust and cooperation. By following the robust processes we were able to create value, deliver the project on time and accommodate over 40 variations within budget. Robert Woodhead were engaged through the EMPA Minor Works Framework in February 2013. 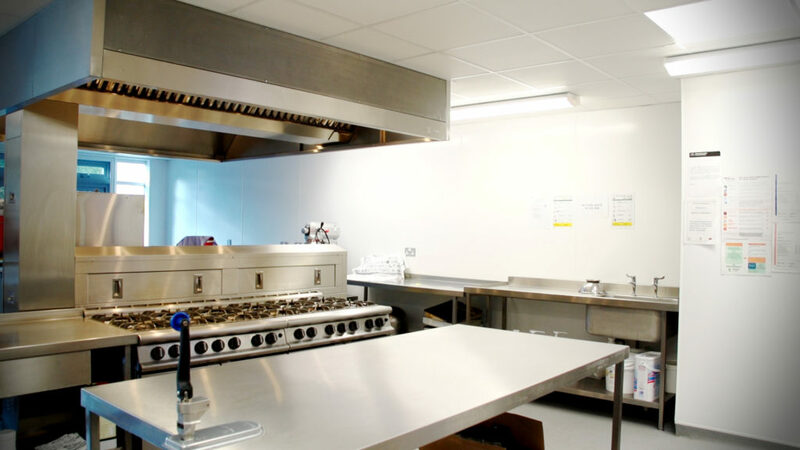 The scope of works included: substantial asbestos removal, removal and replacement of suspended ceilings throughout the two school buildings, installation of an air handling unit, new kitchen and white Roc hygienic panelling as well as replacement of lighting installations. The school is on a split site and over the summer holidays an after school club is held in one of the buildings. The school is located in a densely populated area with restricted access and parking. A programme was formulated to allow the afterschool club use of the building, whilst work was undertaken. Out of hours works were programmed so the afterschool club could continue to operate undisturbed by the building works. A separate designated access and egress route was established for the afterschool club. Deliveries were restricted to off peak times. The club also visited the project to see work being carried out, this helped to demonstrate the potential dangers of construction sites. Two weeks into the project a pre-existing drainage issue enabled rain water to flood the school hall causing damage to hundreds of stored files, books and class work. Within 8 hours the storage boxes were removed, the existing floor was dried and a replacement storage unit ordered and delivered to site. Sandbags were filled and placed outside the external doors to stop this from happening again. The 385kg air handling unit was designed to be installed on the flat roof above the kitchen, the team were unsure if the roof was structurally sound enough to take the weight of the unit. The air handling unit had a lead time of four weeks, it was critical to the delivery of the project to install the unit with no design amendments. Due to the presence of asbestos in the ceiling above the kitchen the Structural Engineers could not undertake a typical investigation in the ceiling void. An Asbestos Analyst entered the ceiling void under controlled conditions to survey the existing roof joints enabling a structural report to be produced. To avoid redesigning the air handling unit additional structural re-enforcements were installed to support the unit.